There’s no prizes for guessing that this Westminster road, which runs from Greycoat Place to Millbank and Lambeth Bridge, in pre-bridge days led down to a horse ferry across the Thames. The ferry was, in fact, the only licensed horse ferry along the river and did quite a trade in conveying horses and their riders as well as carriages across the river. Mentions of the ferry date back to medieval times but it’s suggested there may have been a ford here back as far as the Roman era. 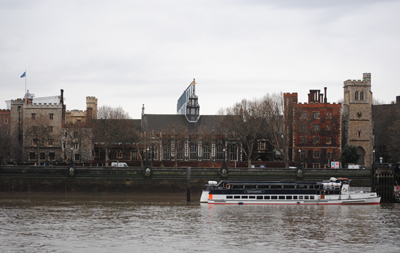 The income from the ferry went to the Archbishop of Canterbury (his official London residence lay across the river at Lambeth). 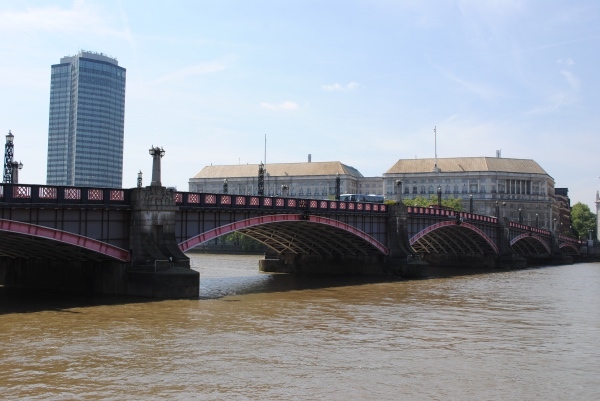 So lucrative were the ferry rights that when Westminster Bridge was built in the mid 18th-century, the archbishop was paid £3,000 in compensation. There are a number of famous figures associated with the ferry – Princess Augusta, later the mother of King George III, reportedly used it on the way to her wedding in 1736, and almost 50 years before that, the ferry pier is said to have been the starting point for King James II’s flight from England in 1689. There are also a couple of high profile disasters associated with the horse ferry – Archbishop Laud’s belongings apparently sank to the bottom when the ferry overturned in 1633 and Oliver Cromwell’s coach was apparently lost during a similar incident in 1656 – both events were apparently seen as bad omens (not to mention expensive). Horseferry Road, meanwhile, is these days home to government buildings including Horseferry House and the City of Westminster Magistrate’s Court, as well as the Royal College of Veterinary Surgeons and, since the mid 1990s, Channel 4’s HQ. 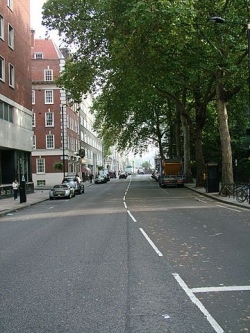 Horseferry Road was also the location of the Australian Imperial Force’s administrative HQ during World War I and it was in this thoroughfare that Phyllis Pearsall was living when she conceived the London A to Z. The origins of the Thames-side district Lambeth’s name are not as obscure as it might at first seem. First recorded in the 11th century, the second part of the name – which apparently is related to/a derivative of the word ‘hithe’ or ‘hythe’ – means a riverside landing place while the first part of the name is exactly what it seems – ‘lamb’. Hence, Lambeth was a riverside landing or shipping place for lambs and cattle. There has apparently been a suggestion in the past that the word ‘lamb’ actually derived from an Old English word meaning muddy place, hence the meaning was ‘muddy landing place’. That theory, however, is now generally discounted. Lambeth these days is still somewhat in the shadow of the much more famous Westminster river bank opposite but among its attractions is the Imperial War Museum (located in the former Bethlem Hospital, see our earlier post here), Lambeth Palace (pictured above) – London residence of the Archbishop of Canterbury, and, of course, the promenade of Albert Embankment (sitting opposite Victoria Embankment). The headquarters of MI6 is also located here in a 1994 building designed by Terry Farrell (among its claims to fame is its appearance in the opening scenes of the James Bond film, The World Is Not Enough). Lambeth – the name is also that of the borough in which the district is located – was formerly home to the Vauxhall Pleasure Gardens which closed in the mid 19th century (see our earlier post here). • The author of the Harry Potter books, JK Rowling, received the Freedom of the City of London this week. The books have sold an estimated 450 million copies worldwide and have been made into films. The Freedom ceremony took place at Mansion House, the official residence of the Lord Mayor of London. Speaking before the ceremony on Tuesday, Rowling was quoted as saying that both her parents were Londoners. “They met on a train departing from King’s Cross Station in 1964, and while neither of them ever lived in London again, both their daughters headed straight for the capital the moment that they were independent. To me, London is packed with personal memories, but it has never lost the aura of excitement and mystery that it had during trips to see family as a child. I am prouder than I can say to be given the Freedom of the City, which, on top of all the known benefits (and few people realize this), entitles me to a free pint in The Leaky Cauldron and a ten Galleon voucher to spend in Diagon Alley.” For more, see www.cityoflondon.gov.uk. 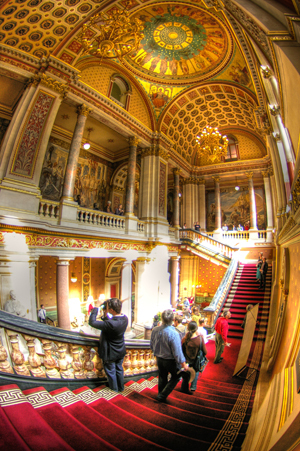 • It’s Open House London weekend again and there’s scores of properties across the city which will be opening their doors to allow the curious a rare glimpse inside. The properties which will be open include architect’s homes and cutting edge housing as well as historic city landmarks, landscape projects and government buildings (including the Foreign Office & India Office – pictured). Other highlights of this year’s event – conducted under the theme of ‘The Liveable City’ – include a night hike, a festival aimed at kids and families, talks, walks and cycle tours and competitions. Among the buildings flinging their doors wide are Lambeth Palace, home of the Archbishop of Canterbury, livery company halls, the newly reopened St Pancras Renaissance Hotel and the Bevis Marks Synagogue in the City. Most properties can simply be visited on a first come, first in basis but some do require advance booking so check before you go. Open House London was first started 19 years ago and has since spread to many other cities around the world including New York, Jerusalem and Helsinki. For more information and to purchase an online guide, see www.londonopenhouse.org. PICTURE: (c) Nick Woodford. • The Museum of London has launched an online collection of early Twentieth century fashion photographs to coincide with London Fashion Week. The more than 3,000 glass negative plates come from the collection of Bassano Limited, founded by Italian-born Alexander B. Bassano, and were taken between 1912 and 1945. They record a wide range of fashions as well as designers and retailers and can be accessed via the Museum’s Collections online web portal. Meanwhile, the museum is hosting it’s first ever professional catwalk show on Friday night. It features the works of Christopher Raeburn. For more, see www.museumoflondon.org.uk. • A Henry Moore sculpture, Large Standing Figure: Knife Edge, has been returned to Greenwich Park, more than four years after it was removed. The almost five metres tall sculpture, made by Moore in 1976, was originally placed in the park in 1979 but was removed for conservation in early 2007 before joining a Moore exhibition at Kew Gardens and then forming part of the Henry Moore display at the Yorkshire Sculpture Park. The bronze, on loan from The Henry Moore Foundation for two years, has now been returned to its original location between The Avenue and Croom’s Hill Gate. Running southward from Trafalgar Square towards the Houses of Parliament (the southern part of Whitehall is actually known as Parliament Street), Whitehall is lined with government buildings – everything from the Foreign Office to the Cabinet Office, from the Scotland and Wales Offices to the Ministry of Defence – and has become so identified with government that its very name is now used to mean just that. But where does the name come from? Whitehall takes its name from the Palace of Whitehall which once stood on the site of the current street. The palace’s origins go back to the 14th century when a grand house known as York Place was built as the London residence of the Archbishops of York. The building was gradually expanded over the years – work which continued when Thomas Wolsey was made Archbishop of York in 1513. When Cardinal Wolsey fell from favour in the late 1520s, however, King Henry VIII seized the house along with his other assests. 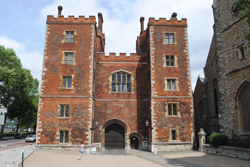 With the royal Palace of Westminster badly damaged in a fire in 1512, King Henry VIII had been staying at Lambeth Palace. He saw the newly acquired palace, renamed Whitehall, as a suitable new home and continued expansion works, constructing a series of recreationally-oriented buildings on the west side of what is now Whitehall including tennis courts, a cockfighting pit and a tiltyard for tournaments. By the time of Henry VIII’s death in 1547, the palace covered 23 acres and was the largest in Europe. The palace continued to be used by subsequent monarchs until much of it was destroyed by fire in 1698. These days the only surviving part of the palace is the Banqueting House. Built by Inigo Jones for King James I, it was from a window on the first floor of this 1622 building that King Charles I stepped onto a scaffold where his head was cut off. Apart from the Banqueting House, other significant sites in Whitehall including the Cenotaph, the focus of Remembrance Sunday commemorations. Downing Street, meanwhile, runs off the south-eastern end of Whitehall and behind gates which have blocked it off since 1989, stands the Prime Minister’s official residence. • The British Military Tournament takes up where the Royal Tournament left off. The abolition of Royal Tournament in 1999 ended almost 120 years of tradition and left a significant gap in London’s annual events calender. No longer. The concept has been reborn as the British Military Tournament which will be held on 4th and 5th December this year. Presented by ABF The Soldier’s Charity, the spectacle will feature 500 troops, 145 horses, massed bands and the “field gun run” among other things. Tickets start at £29 for adults/£22 for children. www.britishmilitarytournament.com. • On Now – Treasures of Lambeth Palace Library. At the Lambeth Palace Library (open Monday to Saturday (10am-5pm), admission £8 adults/£7 concessions, www.lambethpalacelibrary.org/content/treasuresexhibition). Held in celebration of the 400th anniversary of the library’s foundation, the exhibition in the palace’s Great Hall features some of the most significant books and documents in the English-speaking world including a Gutenberg Bible – the first great printed book in Western Europe using moveable type, the warrant for the execution of Mary, Queen of Scots, signed by Queen Elizabeth I, the 9th century Irish McDurnan Gospels, the 13th century Lambeth Apocalypse, and a rare edition of the Babylonian Talmud. Exhibition closes 23rd July.